Hayes Valley's hotly anticipated new omakase restaurant, Robin, is finally open! Under chef Adam Tortosa (Akiko, 1760), Robin serves traditional Japanese dishes made with local, seasonal ingredients. 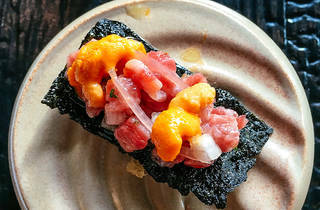 Tortosa, who trained under sushi master Katsuya Uechi in Los Angeles, will offer some a la carte dishes, but encourages guests to try the omakase (chef's choice) experience. On a sliding scale from $79-$179 and tailored to the hunger, interest and taste buds of each guest, the omakase dinner is a tasting menu of the California coast's bountiful seafood options including Monterey uni and Fort Bragg rockfish served sashimi style. 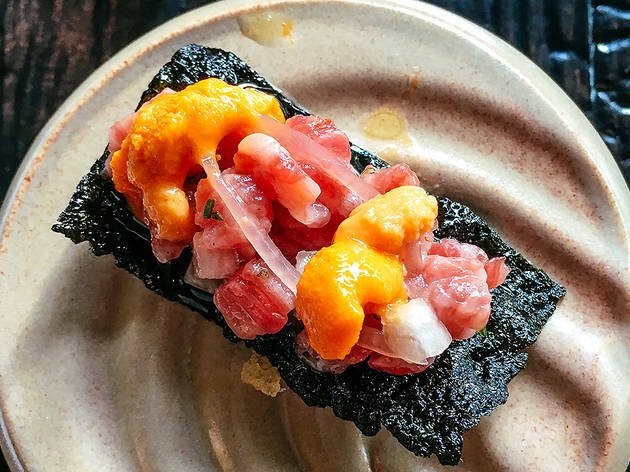 Although the menu is sushi-centric, guests can also order Japanese delicacies such as milk bread toast with torched lardo and smoked maple syrup or sesame noodles with shaved black truffles and Japanese chimichurri. All the condiments are made inhouse, including umeboshi (pickled plums) and blood orange kosho (a paste made from chili peppers). For dessert, homemade soft-serve comes in green tea with olive oil, sea salt and umeboshi or sake lees (what's left over when sake ferments) with cara cara granita and pistachios. For those looking for a cool new date night spot, the interior of the restaurant is just as stunning as the sushi. Tortosa worked closely with local artists and designers to create a sophisticated, contemporary space with a touch of rock star glam. Caroline Lizagarra decorated the cement floors using a centuries-old technique called kintsugi (traditionally used to repair broken pottery with gold), and added rose gold drips to the smokey-grey walls. Robin’s pink neon logo on the wall—already an Instagram-favorite—was crafted by Bay Area designer Jordan Ma, the coral mosaic tiles were made by FireClay Tile, and food is plated on custom tableware from Jered’s Pottery. Raw fish lovers will want to make this their go-to spot this summer. For more information on the menu and opening hours, check out their website.